Today in this post I will tell you how you can manage minutes of your meeting. Minutes, also known as protocols, are the instant written record of a meeting or hearing. Minutes.io in a free service which lets you do the same. After a meeting gets completed you need to make minutes of your meeting for future records and for those who haven’t attended that meeting. 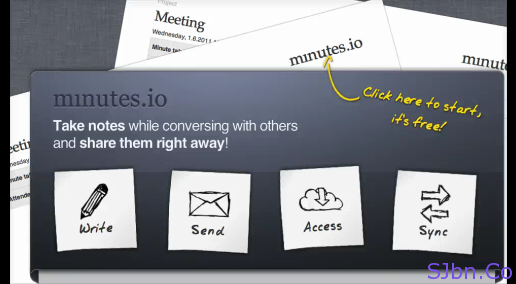 In minutes.io lets you create minutes for free and no sign-up required. You will easily able to create your minutes with their clean and user friendly UI, which also include shortcut keys to make your work faster. You will able to use minutes.io even after your internet got disconnect. And you can view your old minutes without connecting to internet because it works on HTML5 and save data to your local computer (using cache), so you don’t need internet to access your old minutes. From minutes.io you will able to email all attendees without opening your any email account. If you have any question or problem let me know. See this below video to know how to use it. Thanks a lot for the nice review, Saket!